JEKL Steak On The Go! It’s not jerky. It’s not biltong. Steak on the Go is different, made using new production methods to create a unique product. Tender cuts of slow-cooked* grass-fed beef, in three delicious flavour combinations using the finest ingredients. Marinated, hand-seasoned and dried. 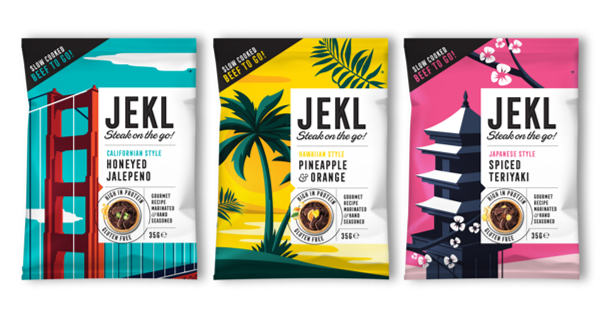 With Steak on the go JEKL is creating a completely new category of meat snack. There is simply nothing like it. High in protein, Low carbs, No artificial colourings, flavourings or preservatives, Gluten free, Nitrite Free.